Japanese Episode AG 093: "Paaruru to Banebuu! Shinju o Sagase!" 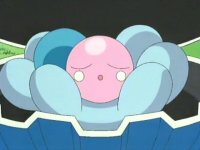 American Episode 365: "Clamperl of Wisdom"
Satoshi and his friends are on a ferry to Refure Island on the way to Tokusane City, the home of Satoshi's seventh Gym Battle Challenge. Along the way, the gang encounters Banebuu, the pig pokemon whom the group had encountered before. The pokemon drops its pearl into the ocean, so Satoshi-tachi send their pokemon out to search for it. When the pearl isn't found, the gang decides to continue onto Refure Island. There, they meet a professor named Izaki who informs our heroes that they can just get another pearl from Pearlu, the bivalve pokemon. In the meantime, Banebuu takes a special blue pearl that Izaki had been studying and runs off, forcing everyone to chase after it. The pearl is eventually switched with the pearl of a wild Pearlu, and so the Rocket-Dan appear and kidnap the pokemon. They try their best to get the water-type pokemon to open its shell and give them the blue pearl, but it won't budge. 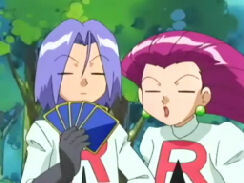 Satoshi and his friends eventually catch up with the Rocket-Dan and quickly defeat them in a pokemon battle. Afterwards, the Pearlu is persuaded to hand the blue pearl back to Izaki. In addition, it decides to give one of the pearls in its body to Banebuu! Now that the pig pokemon has its pearl back, our heroes can continue on their journey through the Houen region. The eighth American season, Pokémon Advanced Battle starts with this episode, and, well, it's a rather crappy episode to start a new season with. It's a pretty bland filler episode that just recycles the plot of the previous Banebuu episode (which only took place fourteen episodes ago), and if it weren't for the Rocket-Dan's attempts at opening the clam's shell, this episode would rank as one of the worst in the series. Really, it's episodes like this one that prove that the trio of Musashi, Kojirou, and Nyasu are worth keeping around. Since we're in a new season in the U.S., we get a new opening theme as well. The opening is a full minute long, which is pretty long for a dub opening (in comparison, the last dub opening was only 46 seconds long). 4Kids takes clips from the third and fourth AG opening, Pokemon Symphonic Medley and Battle Frontier, and condenses the two minutes and 53 seconds of footage (1 minute 27 for Pokemon Symphonic Medley and 1 minute 26 for Battle Frontier) into 60 seconds. As a result, we get a bunch of sped-up footage and footage that there wasn't enough room for. The Japanese version, meanwhile, is still using The Challenger!! as the opening theme. 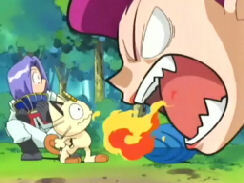 In the Japanese version, Hayashibara Megumi returns from her maternity leave and resumes her roles as Musashi and Mizugorou as of this episode. I'm very grateful, because the lady who was filling in for Hayashibara-san during her maternity leave (Hiramatsu Akiko) was terrible. Three seconds are trimmed from the opening shot of the episode. In Japan, the episode before this one introduced a new type of episode title screen, which shows Satoshi's badge case and Haruka's ribbon case instead of the map of Houen. 4Kids kept the old map title screen in the last episode (probably because it would look better to change the title screen during the first episode of a new season instead of the last episode of the previous season) and waited to update it with this episode. Surprisingly, 4Kids decided not to edit the PokeBall symbol on the badge case in the title screen. They kept it all as-is, which contradicts the rectangle pattern that we've seen in the dub up until this point. It's going to be interesting to see what they do when the badge case shows up in future episodes; if they continue changing the PokeBall into the red rectangle, the badge case will be inconsistent with the badge case in the title screen. If they leave it as-is, it'll match up with the title screen, but will be inconsistent with the past two seasons. So really, 4Kids is damned if they do, damned if they don't. Anyway, the title screen is shortened by two seconds. I expect that this will happen with every episode from here until the end of Houen, which means that this will be two seconds less that 4Kids will have to worry about trimming from every episode from here on in. And then, a second is trimmed from the shot of the boat immediately after the episode's title screen. I took some more screenshots for comparison. I'll post larger versions later.